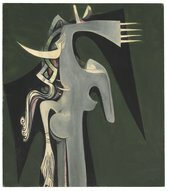 Wifredo Lam was born in Cuba in 1902 of mixed heritage, and pursued a successful artistic career on both sides of the Atlantic. In this film the artist’s son recounts his father’s story and shares his memories. Lam was closely associated with Pablo Picasso and members of the surrealist movement like André Breton. His work poetically addresses themes of social injustice, nature and spirituality, and was greeted internationally with both consternation and acclaim. A witness to twentieth-century political upheaval throughout his long career – including the Spanish Civil War and the onset of World War II – Lam defined a new and unique way of painting for a post-colonial world. Lam’s work now brings a historical perspective to contemporary issues.